Browsing this website is a great place to start, but with the Finger Lakes region being composed of 9,000 square miles, it can get a little daunting. Let us help! Pick the section of the Finger Lakes you want to visit by first looking at the map of the Finger Lakes like a heart with the lakes in the middle. Selecting a region, i.e. Northeast, Northwest, Southeast, Southwest, and Central will help to plan your route from your departure location to navigate in and through the Finger Lakes. Once you’ve selected a region, then select accommodations, activities, places to eat and more. Make sure you visit the vacation packages, itineraries and Finger Lakes events pages for special deals and events that are held during your stay. 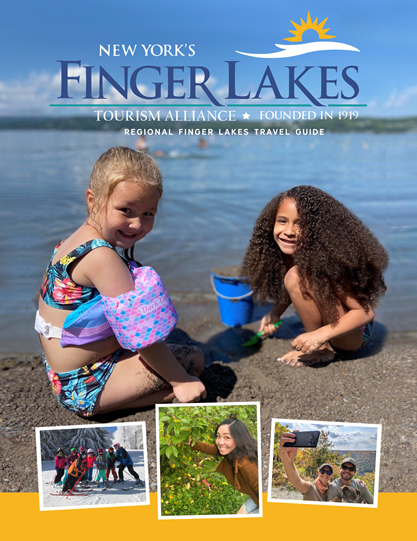 We also produced our annual Finger Lakes Regional Travel Guide in a glossy covered magazine style travel guide to help you pick out all the stops on your journey as well as a Map & Mini Guide so you can quickly reference where you want to go. The Mini Guide is a wonderful fold up map with a comprehensive driving map on the front, complete with driving times between major area locations within the region, and a listing of partner businesses and phone numbers on the back. This Mini Guide is perfect to keep in your car as the Finger Lakes is a driving-oriented region. Order your FREE Finger Lakes Travel Guide and Finger Lakes Map & Mini Guide today!